... Join 1500 other Occupational Therapists for the Royal College of Occupational Therapists annual conference of course!! There are a few ways to catch up on conference this year. 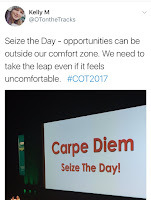 You can check out the tweets from the day on Twitter using the hashtag #COT2017 or you can also check out the list of blogs created by the Blog Squad team which can be accessed here. NB: Formatting on blog set for view on desktop/laptop browser, so If you are viewing on mobile device please excuse picture placement in line with text. P26 - Clicking your way through continuing professional development? Attitudes to social media use as a platform for continuing professional development (CPD) within occupational therapy. My poster summaries the findings of my masters dissertation research, which considered attitudes to social media use as a platform for CPD among students and lecturers on BSc and MSc programmes within one university. You can download a digital copy by clicking here. 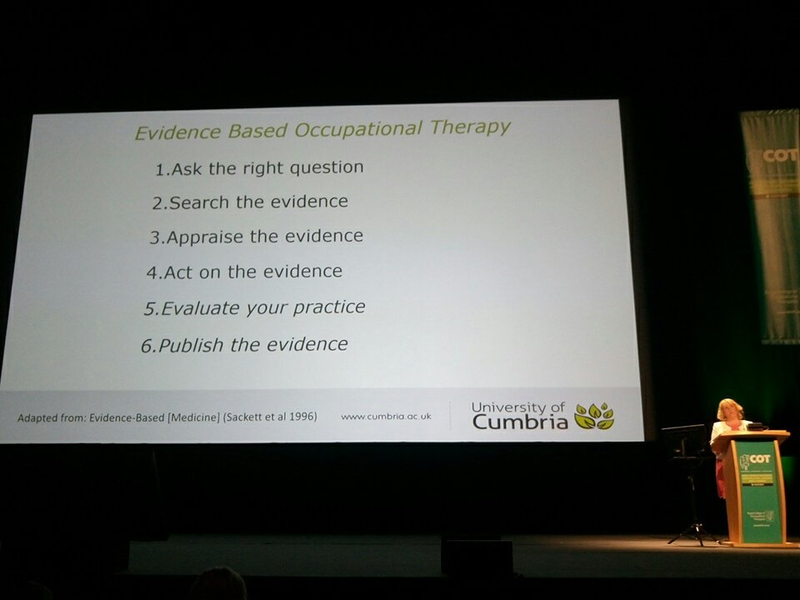 Paul McKee opened the conference with a very energetic and though provoking message that I feel was very relevant to both me as a professional and the Occupational Therapy profession as a whole. Paul challenged us to think about how our mindset affects how we participate and the goals we make in our lives? I'll be the first to admit I can be a drama queen, a catastropher, so I know that mind set can play a huge part in how I approach situations. 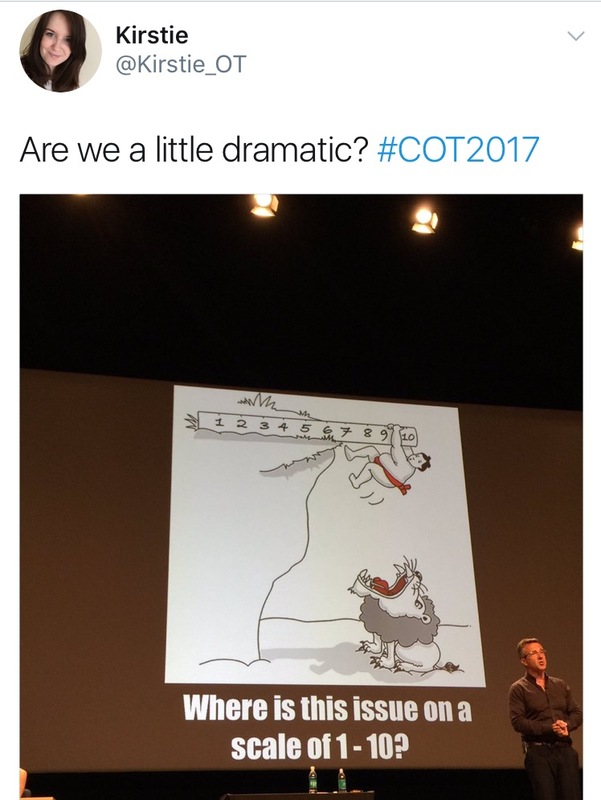 So Paul illustration that helped us reconsider if we are being too dramatic? If 10 is death... is our current situation really that bad? I think this is so relevant in the environments we work in, that are cash deprived and staff are often overworked, our mindsets aren't always set to the positive end of the scale when we look at situations. But if we take time to check in with ourselves, and refocus and look at the situation in another way, then we might just see there are opportunities there; Opportunities to make a difference, to use our core OT skills in a more initiative way that ultimately can help the teams we work in and the clients at the centre of what we do. 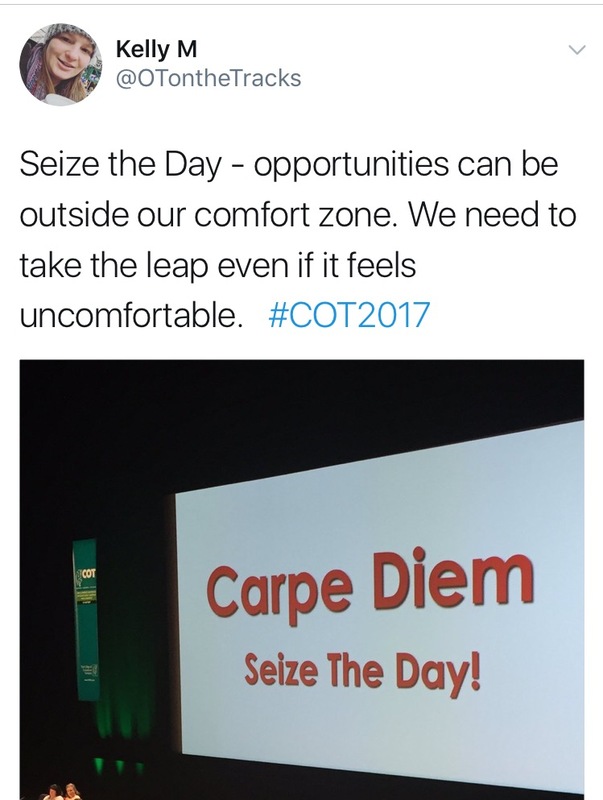 As so often my take home message is to get outside my comfort zone, as Paul challenged us to Seize the Day, grab hold of opportunities with both hands even if it feels uncomfortable. Using OSCE in accessing professional values, attitudes and behaviours in OT students. 15 min assessments which focused on the 6Cs within one situation. Need of large variety of situations so that students weren't advantaged by hearing from others. This poster was initially of interest to me, as a student that commuted to university, not from a rural setting, but just from a distance, who's journey was often disturbed due to environmental issues due to rural settings and weather related instances. 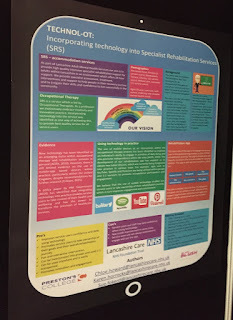 But I found the poster presentation actually engaged my interests in technology and how it can be supported and utilised to engage with students. Supported 'shyer' students to engage in learning. But there needed to be a fast feedback method for this to work successfully. As one of those 'shyer' students, I can totally relate to the aspect of technology supporting engagement in learning, I was and still am more inclined to formats that allow me to share my points in a way that allows me to think through my point and have a little more time to structure my message which technology (online forums/chats) allows for. I also know crucially though that as health students, we need that face to face time too as primarily we are learning to be competent and progressive health care practitioners that will work face to face with people day in day out. I liked the idea of linking with students from around the world to share skills and learning, I could see a great opportunity to learn about other cultures in this way which could benefit the overall learning of not only students in the UK but much wider into developing countries as well. This poster was of real interest to me and if I'm honest was one of the main reasons I chose this session. I have a personal interest as a new graduate with dyslexia, who has recently had to manage the challenges of academic and practice placement with a hidden condition. I also thought this session would be of benefit for my learning for when I one day have a student so all very relevant. T Rushton's study looked at hidden disabilities, but mainly students with specific learning disabilities. Students therapy'd themselves - making their own SMART goals. Some did say they had questioned whether OT was for them. This is wider than just people with disabilities though. Personal and professional identity big part of this process. Support mechanisms are key in enabling participation and success in education. 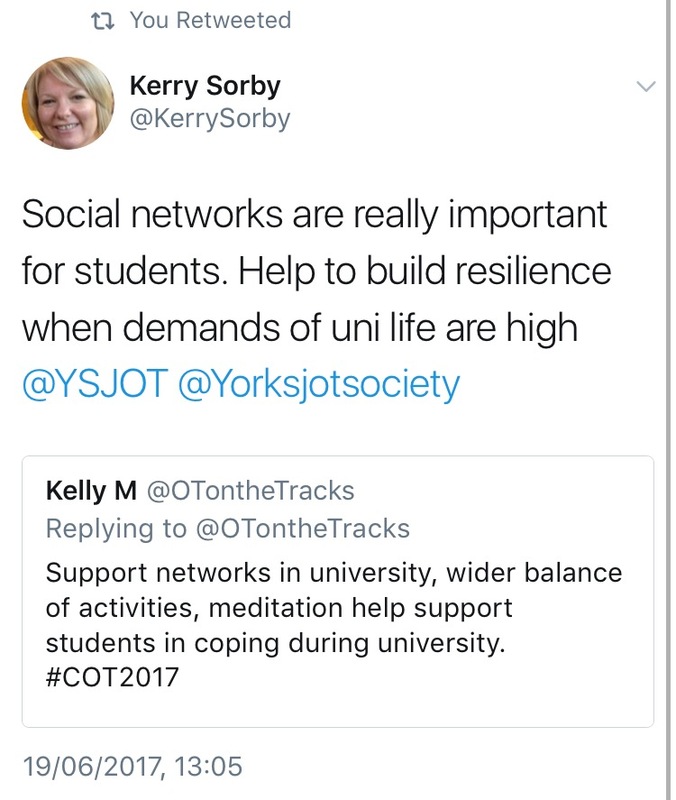 Support networks in university, wider balance of activities, and meditation helped support students in coping during university. 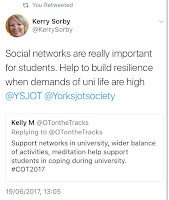 The fact students therapy'd themselves isn't surprising since the study looked at OT students who are at the core problem solvers and adaptors, and is something I often did whilst studying. In the main part if a student has managed their condition throughout their eduction, they will most likely be the most knowledgeable in the situation about what works for them. I'm not saying this is always the case, but it is important not to think as the educator you know best. This is also the case when it comes to practice placements, although this can be one of the most challenging times as techniques and adaptions made that are suitable for academic university courses cant be used in practice due to NHS policies or patient confidentiality and care - for example someone who has a note taker at university probably won't have one on placement as this wouldn't be practice on an NHS ward during an assessment. This is a bit of hot topic for me, as I feel that for students entering a profession such as OT which has a lot of clinical writing and thinking as part of every day work, the placement experiences are incredibly important in helping the student transform and trail the strategies they will take with them into working life. I would have been really interested in hearing more about how the university supported students through this process, possibly as a case-study, as with such a large cohort of students each year I would expect they encounter a larger percentage of students with additional support requirements than a smaller university cohort. SJ Kennedy shared on the using reflective share sessions to support the building of therapeutic resilience. Prior to sessions, students were asked to prepare a written reflection to bring to the group. Areas highlighted by students as difficult were: Death & dying, sharing difficult news, making mistakes, confidence to speak to educator among others. Students reassured during these sessions that other felt the same way on issues too. Can OTs in practice help with sessions on these areas? Theory to practice links. 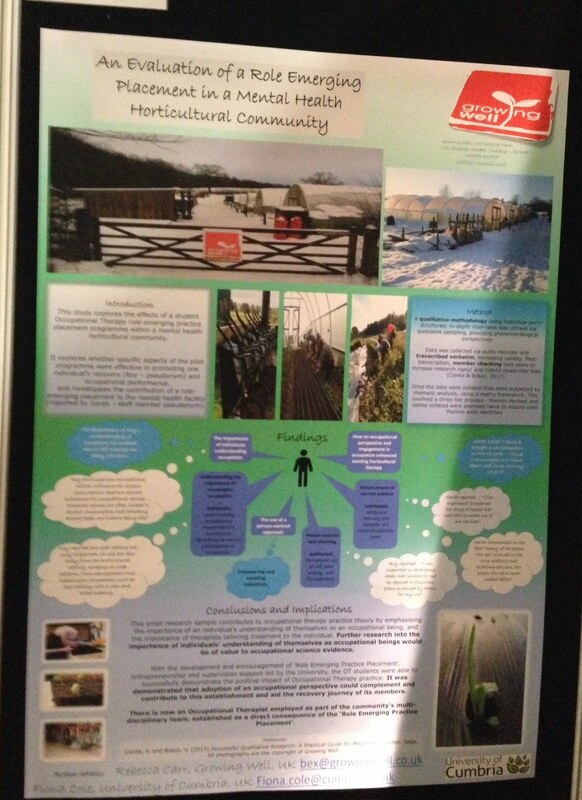 Rebecca shared on the positives of her role emerging placement within a mental health horticultural community. She evaluated the success of the setting as a role emerging placement. 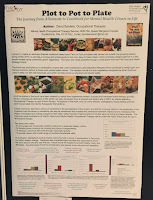 the role occupational therapists can play in enhancing horticultural therapy by adding our unique understanding of occupation. The value occupational therapists can bring in providing client centred planning and intervention. The value of Occupational therapy is clearly evident to the service as there is now an Occupational therapists employed there as part of the team. David Sanderson shared about the use of Horticultural project within Occupational therapy in Fife. The allotment supported healthy eating and cooking with clients (individuals with severe and enduring mental health conditions). Clients helped support the creation of a cook book to use. The was an increase in motivation within the client group. Social aspect to group - reducing isolation for the clients involved. Challenges: Location of allotment is a distance from town, which requires individuals to be supported to travel there initially. The aim is that OTs would use this as part of public transport practice/assessment with clients that attended. Can this be adapted to Older Peoples inpatient MH? 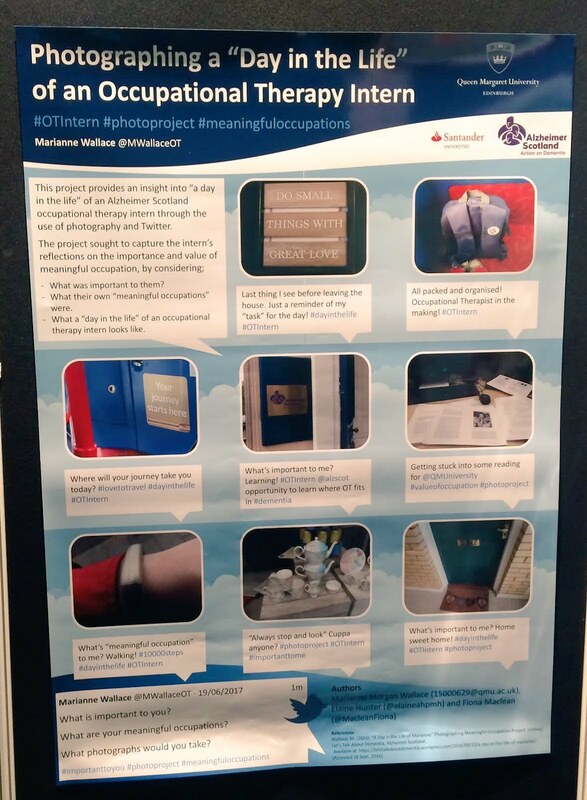 Marianne shared on her experiences as a occupational therapy intern with Alzheimer's Scotland by using photographs as a basis for her discussion. Everyones life is made up of our everyday occupations and how we engage with these. What are these meaningful occupations to us and our clients? I came away from this session with a desire to really connect with my own everyday occupations. I aim to take up the challenge to document a day in my life and really think about how I engage with the occupations I need and want to do. 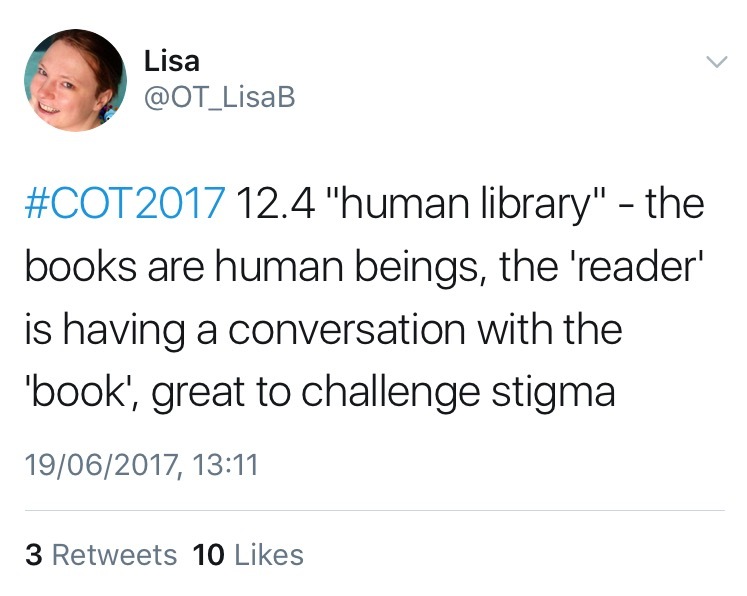 Cathy and Natasha shared on the concept of a Human Library and how this could support social dialogue with clients. 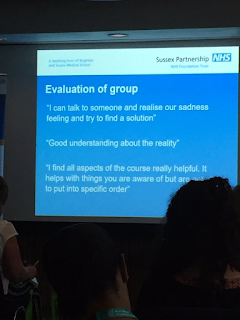 I chose to go to the session as it felt really relevant to some of the people I work with within acute assessment. I found the session really helpful for an overview of Sleep and sleep problems that could face the people I come into contact with. Sophie shared her knowledge on the topic of sleep. 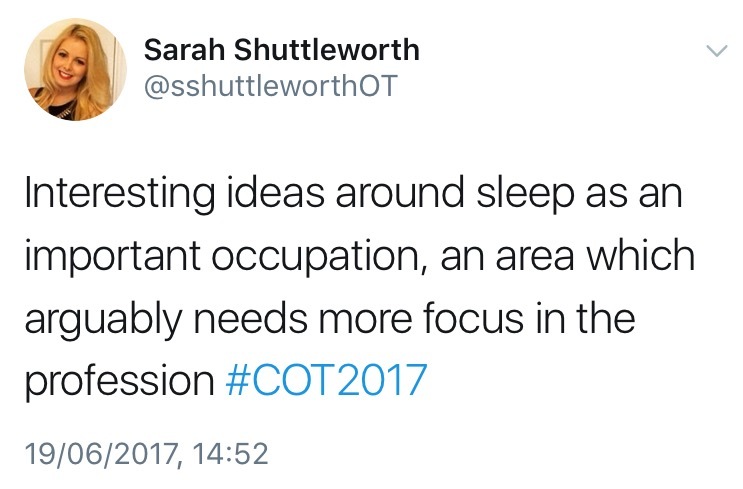 Occupation is our focus as occupational therapists, have we neglected sleep? Are occupations an intentional process? When we are asleep we are in an unconscious state, so in turn it's not an intentional process or occupation. But all the aspects around sleep are intentional so it therefore can be classed as an occupation. What then can OTs bring to the table regarding sleep? 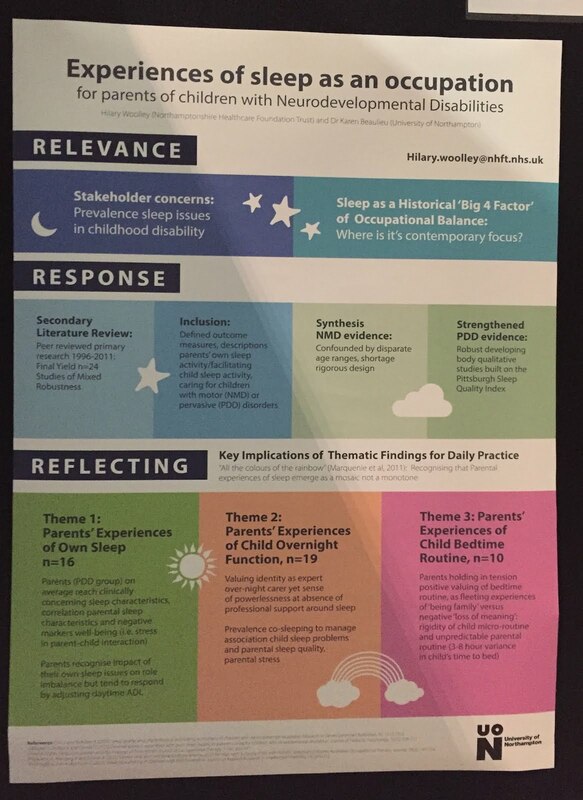 Assessment: Do we ask about sleep as part of our initial assessments? We ask about general routine but does that include the sleep aspect of individuals day in that. 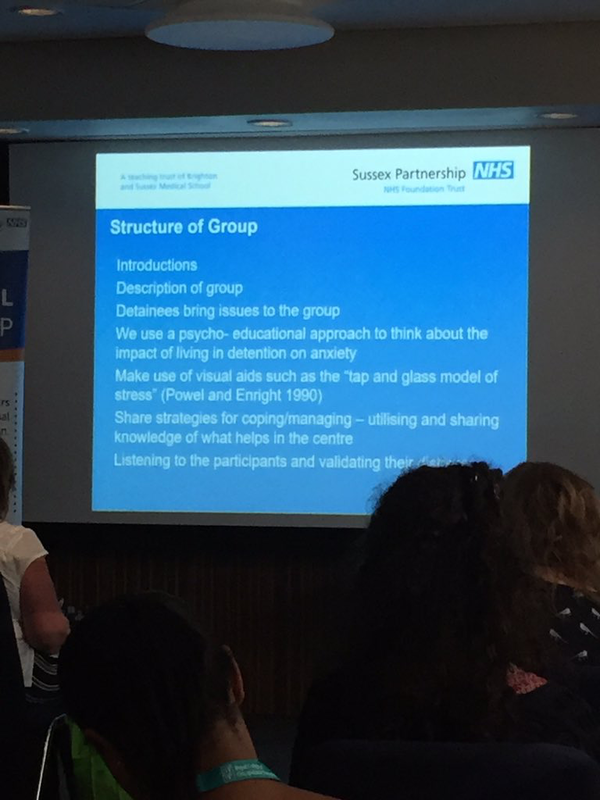 I came away from this session thinking a lot about the environment the patients I see are in when they come into service and how this change in environment alone can impact on the quality of sleep they manage to achieve. How then can we help provide sleep hygiene advice to help aid sleep quality for all the patients in the service, but more specifically the ones we know are struggling as we know the positives of good sleep on an individuals general health and cognitive abilities. I am still very much actively reflecting on this session and feel it is a topic I will be doing more refection and learning on this. Consider how best we can consider sleep in our service to assist our patients. 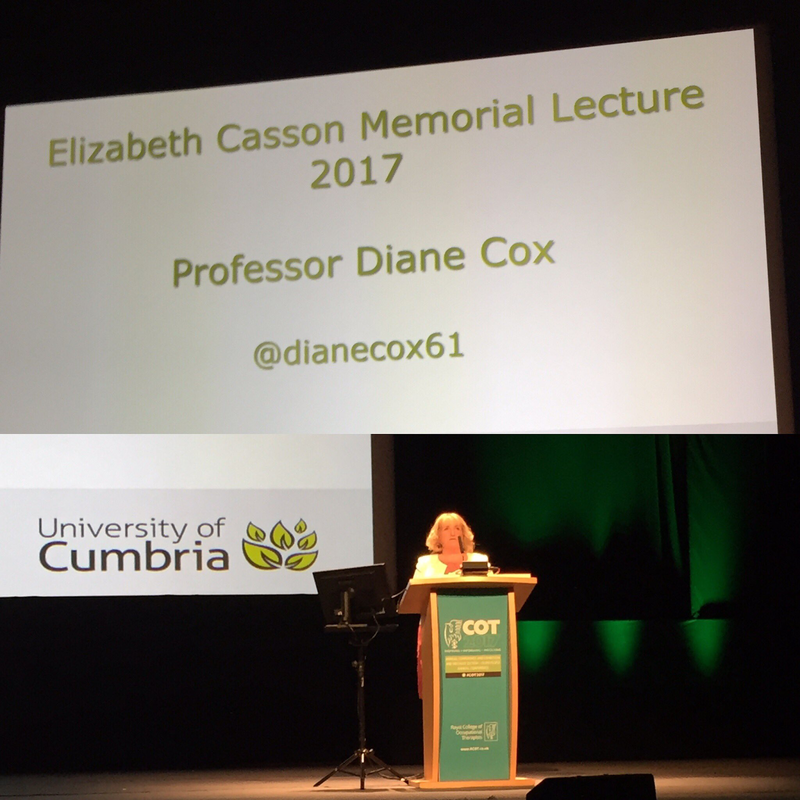 Diane Cox took the stage to share her Elisabeth Casson Memorial Lecture, on the topic of 'Life as an occupational being". 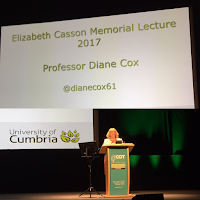 I am lucky to have heard Diane speak a few times before an my student research conference and also as part of the research module at university. She is always a bit of an inspiration and never fails to leave me wanting to go out and do more research! I can't really do Diane justice by summarising her lecture and so I won't attempt to do that. You will be able to read it in the British Journal of Occupational Therapy in the coming months and I heard somewhere there may be a recording available too. But please also check out her blog squad post. I always find the these lectures inspiring, and really like how speakers link our professions past with the present. occupation effects how we feel and vice versa. Thankfully this makes our profession one of the least likely to be taking over by a robot. We need our interaction and understanding of occupations that are so inherently individual to each person it would never be able to be done by a computer programme. It's time we sold ourselves with that confidence in our professions unique value! It's part of your life as an Occupational Being"
Sort out trying to get dissertation research published. Dementia one of the most important health and social care issues facing the world. Are there ADL benefits that are measurable? Use of AMPs as outcome measure on ADL function. Study added original contribution to CST evidence base. It is the occupational therapy program that represents the added value of an occupational therapist delivering the intervention. TAP is a US based occupational therapy intervention used with individuals with dementia and caregivers. Structured around assessment, activity participation and implantation and generalisation and simplification. Service resources, referral processes, person centred values and value of professional reasoning made it less straightforward. I chose to go along to this session as I have a interest in support individuals going through the asylum process integrate into their new environment and engage in occupations that are meaningful to them within their new home. I blogged about the occupational impact for child refugee and asylum seekers previously which can be found here. There is also a Blog Squad post for this session which is really detailed so check that out here. Less than 1% of the world displaced population is supported by the UK. Asylum seekers and refugees suffer occupational deprivation which coupled with physical and mental health issues and social stresses as part of integration can impact on their occupational wellbeing. Research focused around services at drop in centre. Research conducted by team of researchers at York St Johns that included Final yer occupational therapy students. Areas for development - Respondents wanted to be part of developing areas rather than have it done for them. 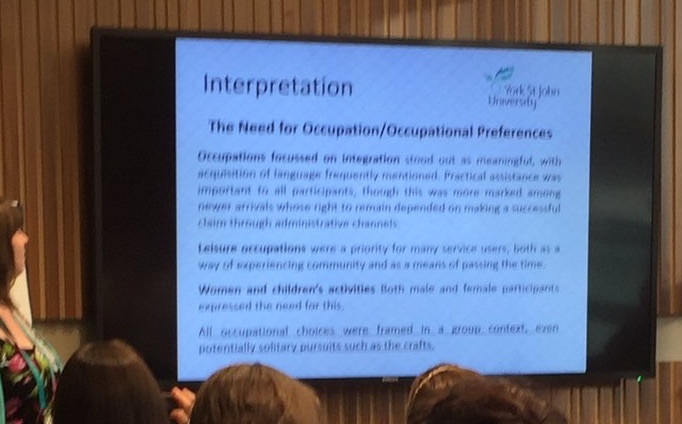 There was a need for occupation/occupational preferences. Social aspect key in occupations being undertaken. We need to use a culturally appropriate model when working with individuals from eastern cultures for example KAWA model (Iwana, 2006) which was created for this purpose. Occupational therapists are well placed to work with client group due to our duel physical mental health skills. Use occupational justice as a basis for fighting for service provision in local area for individuals from asylum seeker/refugee backgrounds. One of the positives I took away from this session was the positive work York St Johns are doing in engaging the research participants as part of their ongoing research, it really showed the value of working with and not to the individuals within the research process. This can be seen in their future plans, where they have set up an advisory panel made up of individuals from the drop in centre to help with planning the next stage of research. OT input as part of supporting individuals mental health and behavioural issues. Trauma - Some may have been tortured or witnessed family/friends suffer atrocities. 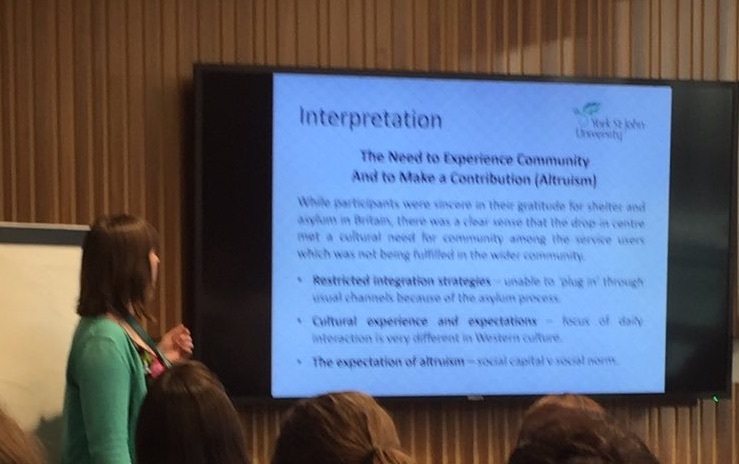 Impact of poor communication/delays by home office can make the situation worse of individuals in detention. 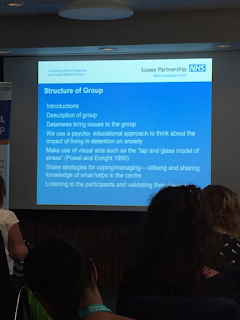 Provide group intervention which will help address mental health difficulties within centre. Nursing staff from G4S co-work in the group. Issues in environment of centre: noise, intrusive environment, breathing , system boredom, dealing with system, internet access (opportunities to process case), feelings of powerlessness. Family problems: Contact with family distressing, missing out on family events, financial and practical issues with family. Clinical/stress related: Anxiety and depression - related to powerlessness , worries about the future, frustration with system & Previous trauma - flashbacks, panic attacks, stress reaction. Ethical point to consider when we conduct research with marginalised communities we are not part of ourselves as researchers. Beware of options in questions that assertion labels as you may discriminate and exclude people without realising. Use approaches that allow lived experiences to be voiced. Closing Plenary - Dr Jennifer Creek - The Empire Strikes Back, Learning from practice on the margins. 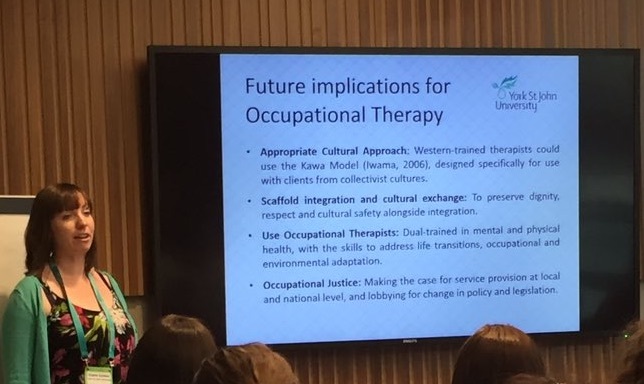 Jennifer Creek took us on a journey of the Occupational Therapy profession from the very beginning, highlighting our role from the very beginning was supporting individuals on the margins of society, those who were mentally unwell or unable to work due to injuries. Jennifer challenged to consider where we are as a profession? Have we become static in our thinking are we fixed on where we are? She encouraged us to take more notice of the margins currently in our communities and strive to reach out to those individuals there. 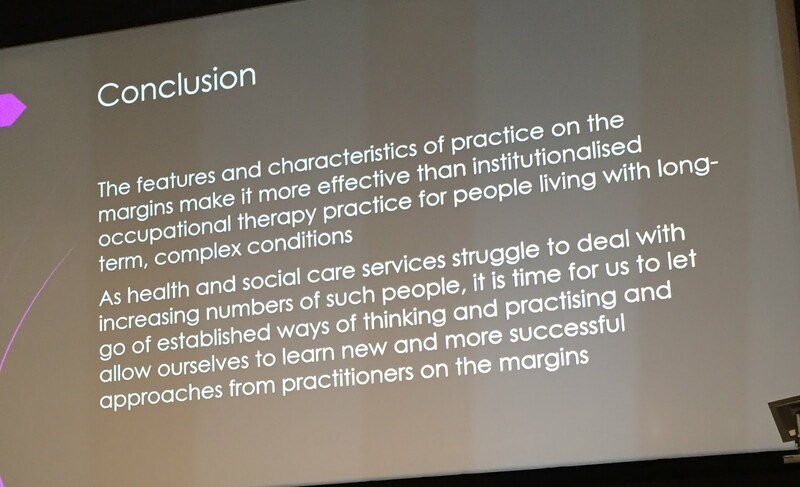 We are a creative professionals as occupational therapists and we need to have the courage to step out and use our skills to help the marginalised communities that are in our reach as the founders of our profession would have. Tina Coldham Mental Health Campaigner - "Last night an OT saved my life"
Tina shared her reflections of being a long term mental health patient and the role an occupational therapist has played in her recovery after her first breakdown. Can I just say that Tina is hilarious, her ability to make a room full of hot, exhausted OTs laugh at the end of jam packed days was amazing. But in all seriousness she had such an important message for us as professionals. We strive to work in a client centred way, that is often far removed from the medical model, but Tina confirmed how important was for her - to have someone who was interested in finding out about her rather than her diagnosis and wanted to know what was important to her. 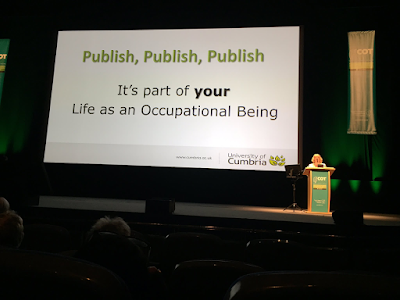 Julia Scott gave us a closing message which this year focused on valuing occupation at the centre of what we do and how we communicate with others, by choosing to no abbreviate or professional title. We need to sell ourselves and value our uniqueness! 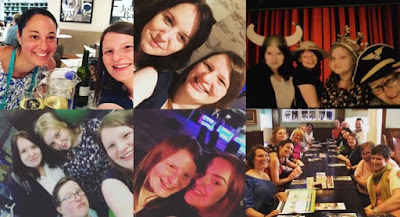 Massive thank you to the Conference Development Team, RCOT, West Midlines Regional Committee (Networking event), Blog Squad, Twitteratti and the rest #OTalk team (#OTalk community meet-up) for making conference such a positive experience. NB: Views and reflections are my own but will have been impacted by discussions and interactions throughout the conference. I have also used pictures of presentations slides to summaries points (and have stated when I have done this), and have referenced these below I have used tweets to help illustrate thoughts and views and where possible I have referenced these at the end of the blog post. Alred, D. & Hobbs, J. 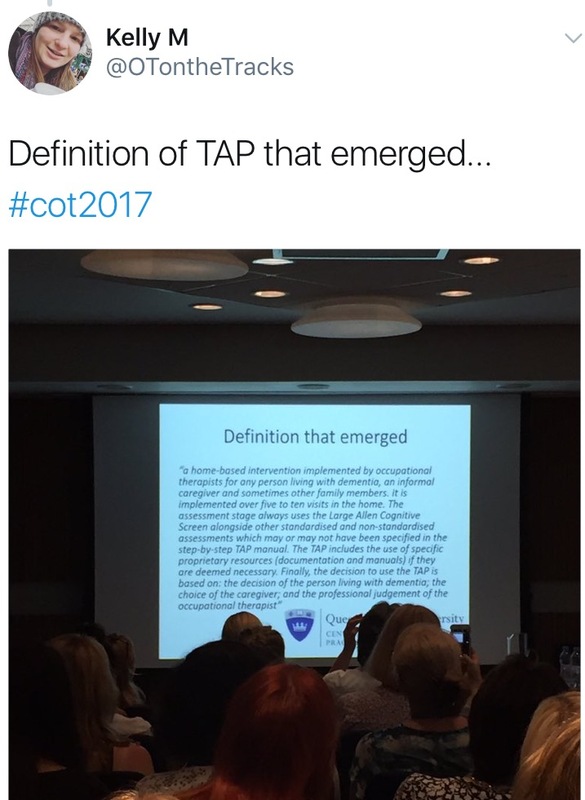 (2017) Session 88.1 Occupational Therapy in an Immigration Removal Centre (IRC) [Paper session to RCOT 41st Annual Conference ], ICC Birmingham . 19th-20th June. Brewer, L, (2017) Session 3.2 Technology Enhanced Learning (TEL): experiences and perceptions of pre registration occupational therapy students. 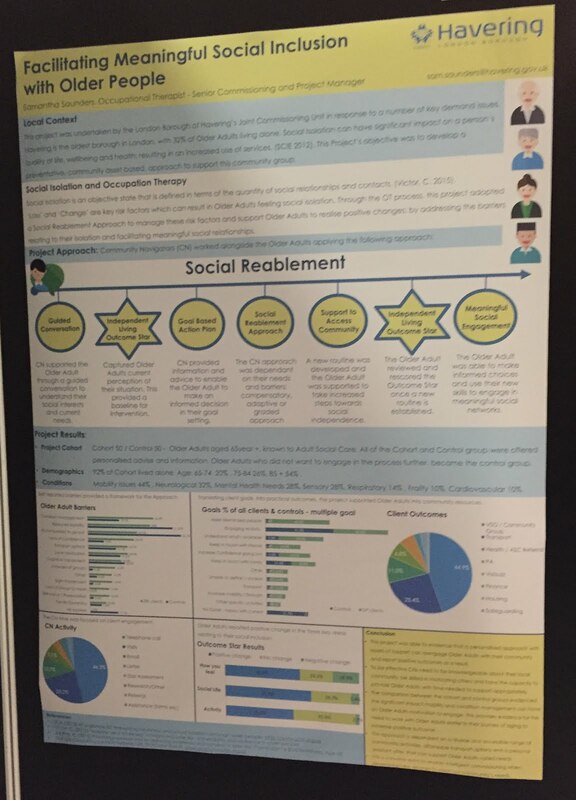 [Facilitated poster session to RCOT 41st Annual Conference], ICC Birmingham . 19th-20th June. 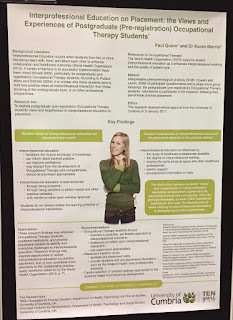 Carr, R. & Cole, F. (2017) Session 12.1 An evaluation of a role emerging placement in a mental health horticultural community [Facilitated poster session to RCOT 41st Annual Conference ], ICC Birmingham . 19th-20th June. 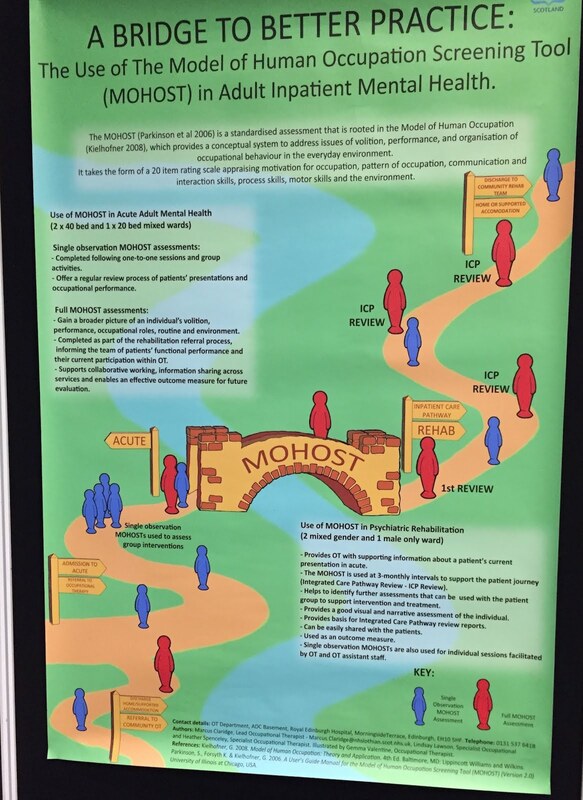 Claridge, M. (2017) A bridge to better practice: The use of Model of Human Occupation Screening Tool (MOHOST) in adult inpaitient mental health. Exhibited at. Royal College of Occupational Therapist Annual Conference, 19th-20th June 2017. 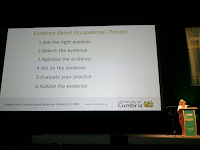 Coldham, T (2017) Last Night an OT saved my life [Closing Plenary] 41st Annual Royal College of Occupational Therapists Conference. ICC Birmingham. 19th-20th June. Cox, D (2017) Life as an Occupational Being [Elisabeth Casson Lecture] 41st Annual Royal College of Occupational Therapists Conference. ICC Birmingham. 19th-20th June. 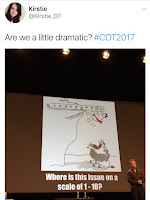 Creek, J (2017) The Empire Strikes Back [Closing Plenary] 41st Annual Royal College of Occupational Therapists Conference. ICC Birmingham. 19th-20th June. Faulkner, S. (2017) Session 22 Sleep, sleep problems and sleep treatments - future direction for occupational therapists. 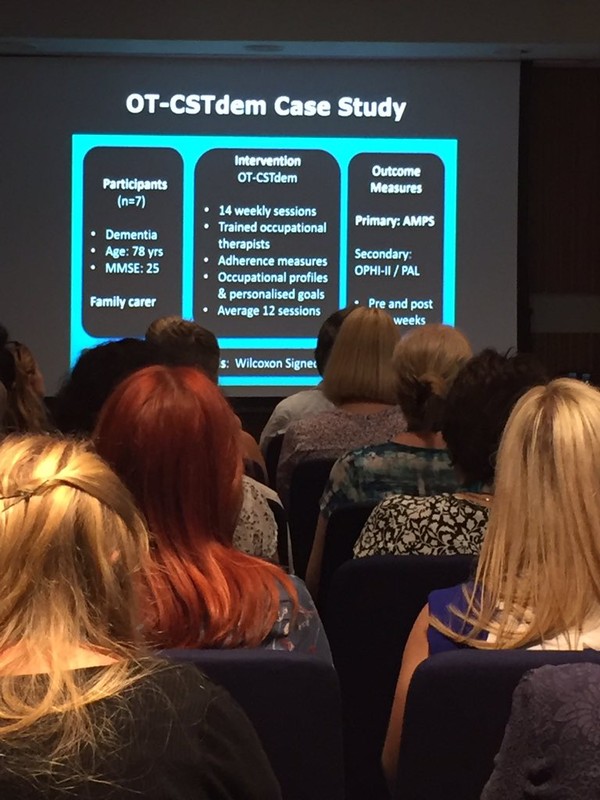 [Seminar session to RCOT 41st Annual Conference ], ICC Birmingham . 19th-20th June. 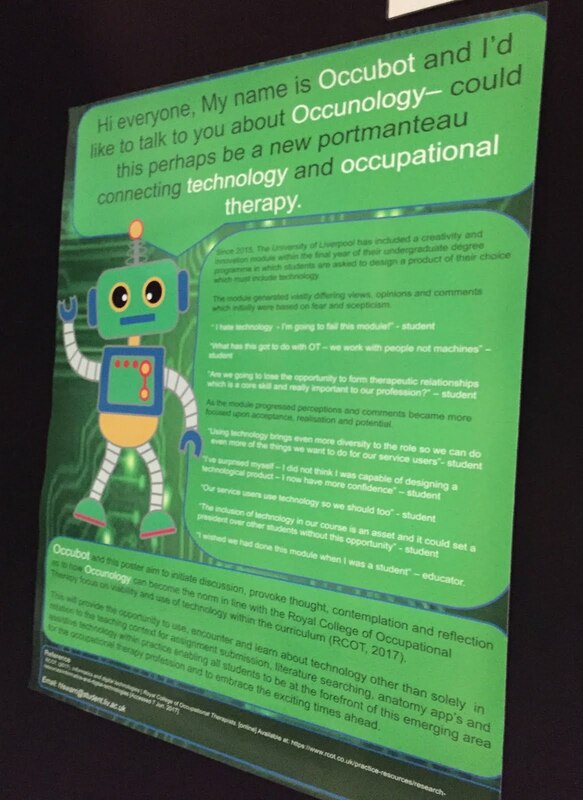 Graham, M. (2017) Session 3.1 Assessing the 6Cs within MSc occupational therapy (pre-reg) students [Facilitated poster session to RCOT 41st Annual Conference], ICC Birmingham . 19th-20th June. 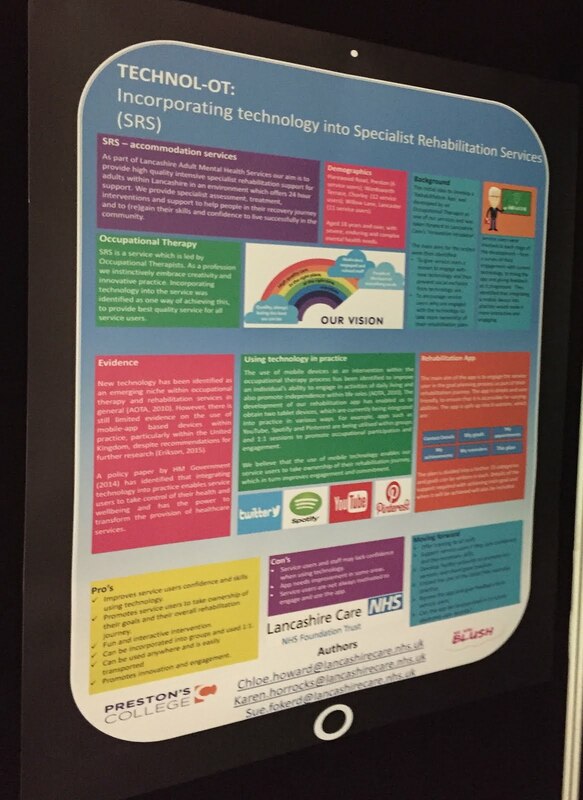 Howard, C. Harrocks, K. & Fokerd S (2017) TECHNOL-OT incorporating technology into specialist rehabilitation services. Exhibited at. Royal College of Occupational Therapist Annual Conference, 19th-20th June 2017. Howlett, F. Spring, H. & Connor, C. (2017) Session 74 The meaning and value of a drop in centre for asylum seekers and refugees [Seminar session to RCOT 41st Annual Conference ], ICC Birmingham . 19th-20th June. Kennedy, S, (2017) Session 3.4 Building Occupational Therapy students resilience and reflective skills within the classroom. 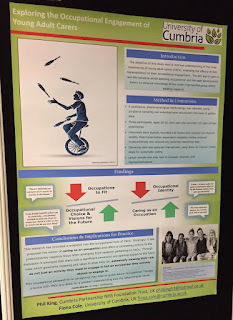 [Facilitated poster session to RCOT 41st Annual Conference], ICC Birmingham . 19th-20th June. Kinsella, N. (2017) Session 42.2 A Study of the implementation of tailored activity programmes in a Scottish Context. 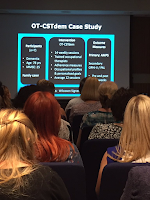 [Paper session to RCOT 41st Annual Conference], ICC Birmingham . 19th-20th June. 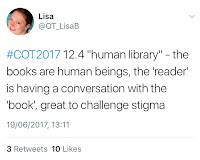 McNulty, C. (2017) Session 12.4 A human library: a new chapter in community collaboration. 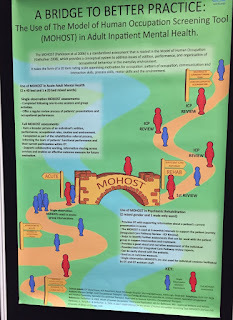 [Facilitated poster session to RCOT 41st Annual Conference], ICC Birmingham . 19th-20th June. 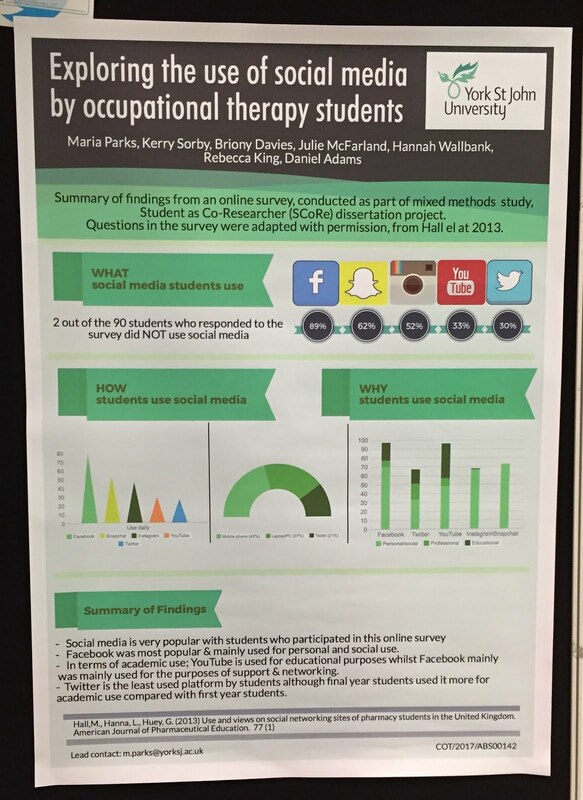 Parks, M.Sorby, K. Davies, B. McFarland, J. Wallbank, H. King, R. & Adams, D. (2017) Exploring the use of social media by occupational therapy students. Exhibited at. Royal College of Occupational Therapist Annual Conference, 19th-20th June 2017. Quinn, P. & Morris K (2017) Interproffessional Education on Placement. 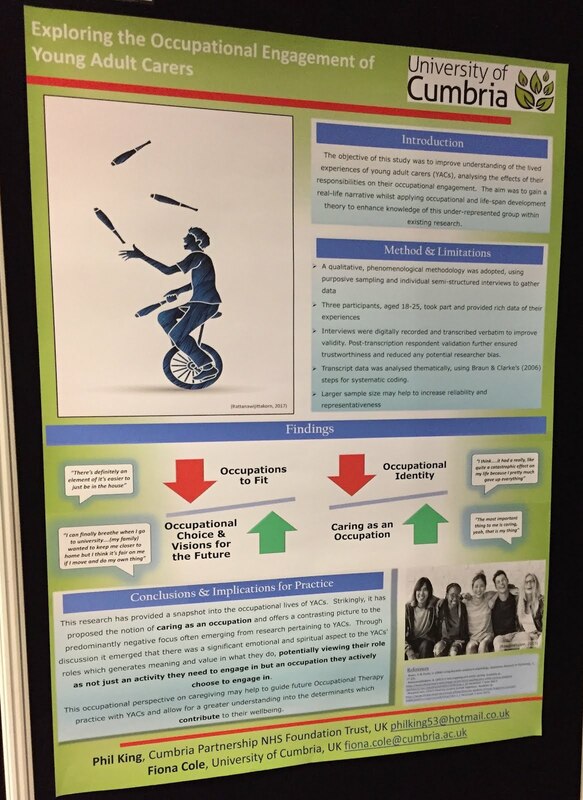 The views and experiences of postgraduate (pre-registration) occupational therapy students. Exhibited at. Royal College of Occupational Therapist Annual Conference, 19th-20th June 2017. Rehling, T. Sixsmith, J. Carr, S. & Chard, G. (2017) Session 42.1 Occupational Therapy perspectives on Cognitive Stimulation Therapy (CST) outcomes in relation to activities of daily living (ADL). [Paper session to RCOT 41st Annual Conference], ICC Birmingham . 19th-20th June. 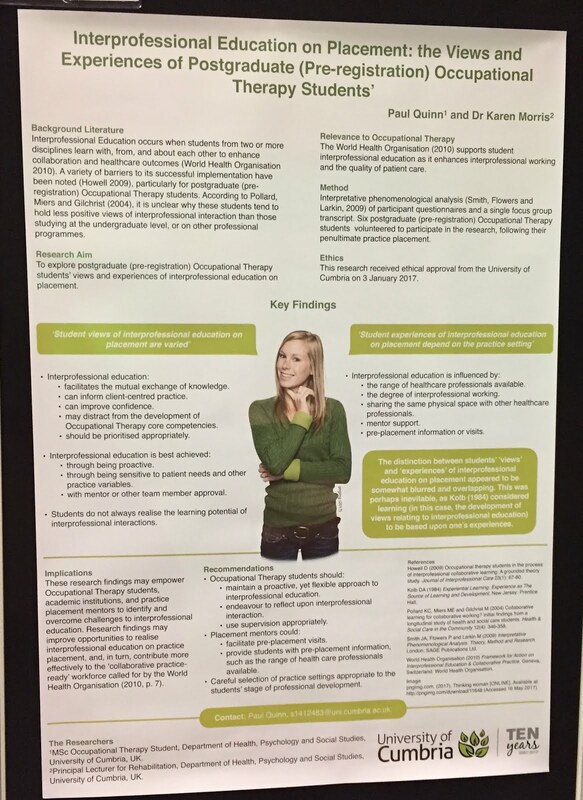 Ruston, T. (2017) Session 3.3 Understanding the experiences of Occupational Therapy students with additional support requirements whilst studying BSc (hons) in Occupational Therapy [Facilitated poster session to RCOT 41st Annual Conference], ICC Birmingham . 19th-20th June. 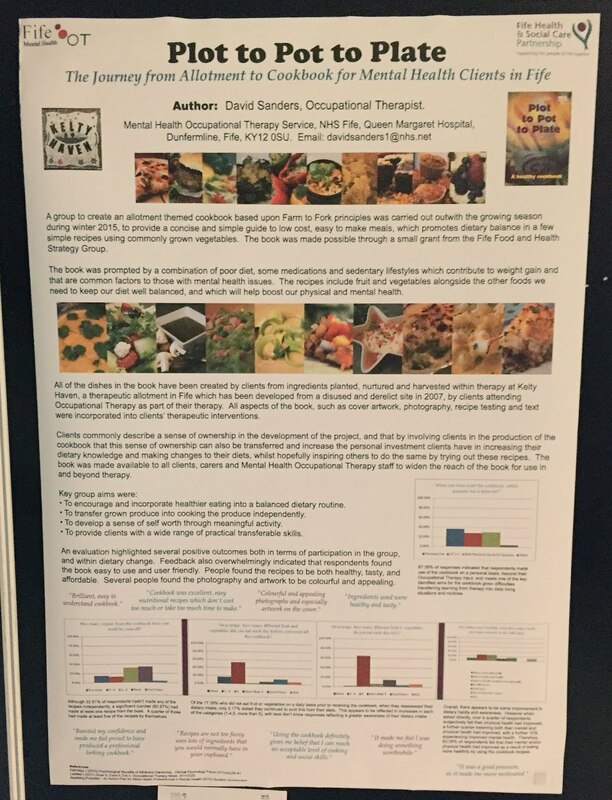 Sanders, D. (2017) Session 12.2 Plot to pot to plate - The journey from derelict allotment to cookbook for mental health clients in Fife. [Facilitated poster session to RCOT 41st Annual Conference], ICC Birmingham . 19th-20th June. Saunders, D. (2017) Facilitating meaningful social inclusion with older people Exhibited at. Royal College of Occupational Therapist Annual Conference, 19th-20th June 2017. Scott J (2017) Closing Remarks 41st Annual Royal College of Occupational Therapists Conference. ICC Birmingham. 19th-20th June. Swenson, R. (2017) Session 88.2 Research with marginalised communities. [Paper session to RCOT 41st Annual Conference ], ICC Birmingham . 19th-20th June. Wallace, M. (2017) Session 12.3 Photography, a 'day in the life' of an occupational therapy intern [Facilitated poster session to RCOT 41st Annual Conference ], ICC Birmingham . 19th-20th June. Warrington, S. (2017) Creativity and innovation becoming an invaluable aspect of undergraduate studies. Exhibited at. Royal College of Occupational Therapist Annual Conference, 19th-20th June 2017. Wooley, H. (2017) Experiences of sleep as an occupation for parents of children with neurodevelopmental disabilities Exhibited at. 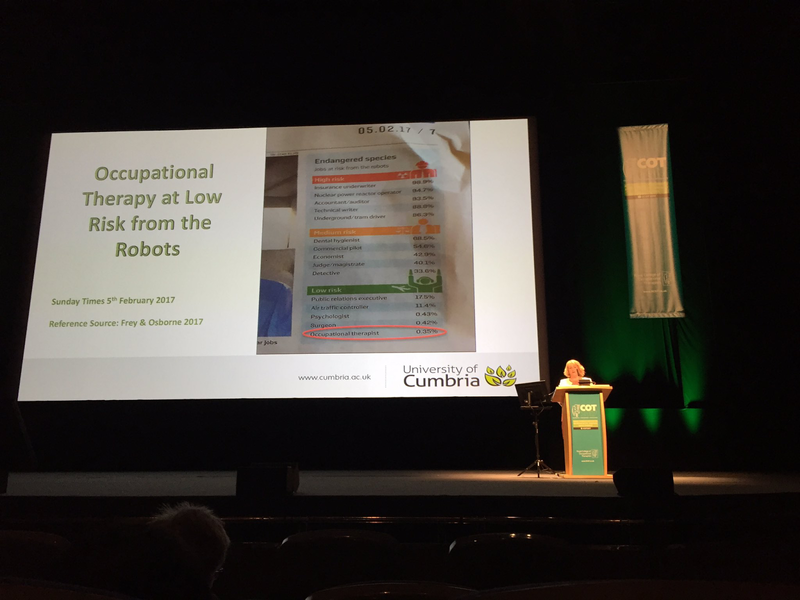 Royal College of Occupational Therapist Annual Conference, 19th-20th June 2017.